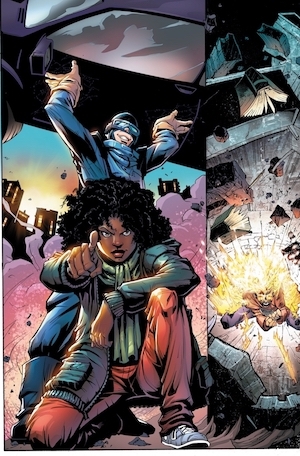 Superhero Squad: Last year, Lion Forge announced plans to create a new superhero universe, which it dubbed Catalyst Prime. Given the current state of the market, that’s a quixotic endeavor, so writer Steve Morris interviewed not one but six Catalyst Prime artists and writers to get their take on what makes this line different from standard superhero fare and why they think it will flourish. The lineup: Writers Alex de Campi (Astonisher), Amy Chu (Summit), Brandon Thomas (Noble), and Joe Casey (Incidentals, Kino, Accell) and artists Damion Scott (Accell), and Ray-Anthony Height (Superb). Passings: Former Marvel president and CEO Jim Galton has died at the age of 92. Creeper Charged: The Calgary Police Service announced Jeffrey Robert Williamson 42, of Calgary has officially been charged with three counts each of voyeurism and publication of voyeuristic recordings. Unsuspecting women and girls were documented in public spaces, malls, and attendees and cosplayers at Calgary Comic and Entertainment Expo. Williamson will next appear in court today. Police Log: Thieves ransacked and robbed the Sin City comic shop in Newport, Whales. Missing was thousands of pounds worth of stock and equipment including comic books and tickets to GeekFest. Fake News Can Be Deadly: A researcher in Uganda has created a comic to educate schoolchildren about bogus health claims, from the notion that vitamins can cure AIDS to the traditional belief that cow dung is an appropriate treatment for a burn. Yes, there are aspects of Bagge’s art that are problematic for telling this kind of story, but he actually addresses some of these issues right up front, before his narrative begins. He is extremely scrupulous when it comes down to sourcing people, images, quotes and events, and the nearly forty pages of notes provide for remarkable reading on their own. When he slightly altered anything, he documented it very carefully. Take the cover, for example. The amusing image of Hurston in a white dress while strapped with a revolver and swearing a Stetson hat while leaning on her car was a composite of several other photos. Every single vignette in this book of carefully paced vignettes is sourced and expanded upon in the notes, which are almost as funny as the story itself. Bagge is not afraid to editorialize from time to time, but he knows when to rein it in and stick to the strict facts and when to weigh in on a subject. That said, it’s obvious that he has nothing but admiration and respect for Hurston, and the vast majority of the drawings are simple talking heads or characters just interacting in a normal way. In the end, it will be up to each reader to decide if Bagge’s drawings are disrespectful or not based simply on his style, but it does seem clear that mockery is not his intent. Throughout the book, Bagge treats every character with respect. Foolish behavior is depicted foolishly, but there is absolutely no distinction between the way he draws white characters and the way he draws African-Americans. Bagge is above all else trying to tell a story and trying to do so in an entertaining way while at the same time stay as close to the record as possible. Road Comic: Jason’s On the Camino is not bad, says critic Hillary Brown, it’s just not as good as his other comics. It’s also a new direction for the Norwegian cartoonist—it’s (apparently) nonfiction, longer than usual, done in plain black and white, and a bit boring; Brown compares it at one point to Eleanor Davis’s You & a Bike & the Road and finds the latter to be more immersive, although Jason’s book is more polished.